I will never forget the moment I was on top of the world. 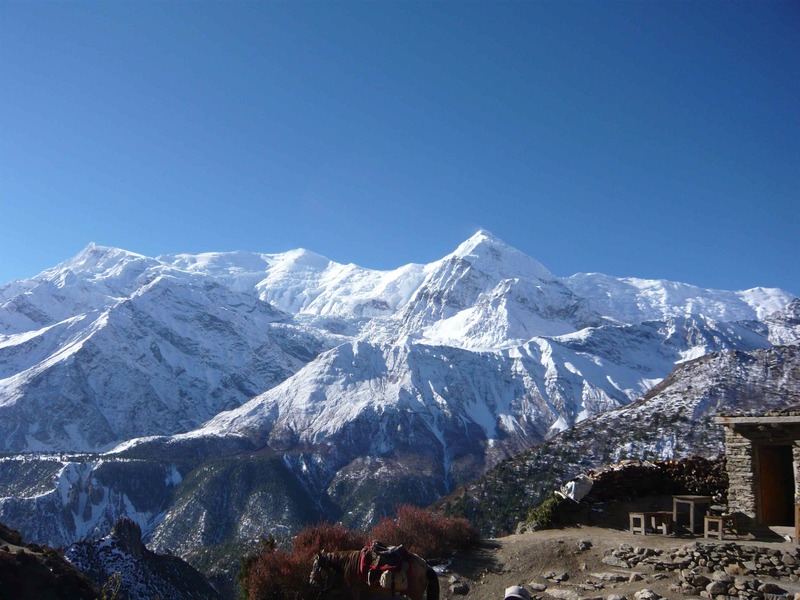 I was trekking around the Annapurna through the world’s largest pass – Thorung La. We rose in darkness and anticipation of our two-hour ascent up to the highest point of our Himalayan hike, the pass at Thorung La at an intimidating 17,769 feet (5,416 m). We had spent a sleepless freezing cold night at Thorung Base Camp to acclimatize before our morning ascent. I remember being so utterly cold during the night in our barren, unheated room that I emptied every single item of dirty clothing out of my pack and slept in everything I had along with three wool blankets. Unfortunately I was still frozen to the bone and could hardly sleep that night due to the high altitude and apprehension about the next day. Would I be ok? Would I get altitude sickness? Would I make it to the top? These were all the worries and concerns that were racing through my restless mind and keeping me up in the middle of the cold, dark night. Our last day-long hike up to the top of Thorung La Pass in Nepal. I am a fighter. I am strong. to climb many mountains beyond. All photos taken along the Annapurna Trek in Nepal. November 2010. I just finished reading Cheryl Strayed’s “Wild: From Lost to Found on the Pacific Crest Trail” a dark, raw and fiercely humorous book on how one woman finds herself during a three-month long trek through the wild Pacific Crest Trail. The book is powerful, emotional, honest and inspiring, and Strayed uses her brilliant memoir to take a hard look at self-discovery, heeling and change. Of course when times are tough, we can’t always pick up our bags and leave town. Yet, I often find that there is no better way to escape and reflect upon life than to go on a hike, and the more remote and wild, the better. I have been fortunate to have done many wonderful adventurous hikes over the years. Although every hike I’ve done has been special and has brought me to a new place, there are a select few that have truly inspired me and are unforgettable. Here is a list of the top five wild hikes that are bound to get your mind thinking. This week has been a bit hairy so I thought I’d post some of my favorite photos of mountains I’ve hiked as they always calm my soul. Photos above from France, Nepal and Guatemala. This fall, I will be adding Bolivia to my list of great hikes. This week’s Sunday Post theme by Jakesprinter is roads. I couldn’t help but think of this theme in both a literal and metaphorical way. As there was one road that I traveled on while hiking the Annapurna trail in Nepal, that changed my life forever and set me on my future path to where I am today. As many of you know, In January I attended the UN Foundation’s Shot@Life Summit along with 45 other fellow Americans, who will be working hard to raise awareness and funding to provide vaccines to impoverished nations around the world. Since January, I have been steadily following all news vaccine-related and have been blown away by India’s quest to become a polio free nation. In one of the most populous nations in the world that has many places that are extremely difficult to reach, the massive effort to vaccinate India’s children and wipe the deadly polio virus away, has been a hair-raising feat. I started my blog thirdeyemom back in February with modest expectations. I have always loved to write and I have been a wanderlust since birth. I wanted to share my experiences of seeing the world with others. I wanted to have some kind of voice besides my leather-bound journal. I felt a little nervous about writing a blog. Many thoughts crossed my mind. What if no one ever read it? What if no one liked it? What if I was disappointed? But excitement and anticipation took over all my doubts and I said “What the hell“, you only live once. By using a pen name, thirdeyemom, no one will even really know who I am! I can be somewhat anonymous. (Yeah…right). Note: This post first appeared in the Elephant Journal. It is a cummulation of my story of how I became the thirdeyemom, why I started this blog, what inspired me to make a difference in my life and others and why I began fundraising for Nepal. The link to the original post is here: Nepal was utterly amazing. How it changed me forever. I am also going to include a copy of the post here. My trip to Nepal and my recent efforts at fundraising have made a huge impact on my life. It is a way to change the dynamic of being a simple traveler to being a compassionate human being who gives back to the community visited. I strongly believe that travel is a gift. It is important to give in return. Without further delay, here is my story. Nepal was utterly amazing. The trek was arduous, humbling and long. We hiked over 100 miles doing on average 4-8 hours of strenuous hiking a day at altitudes up to almost 18,000 feet. But what amazed me most was the magical culture and people that I found in Nepal. Photo of my dad and me at 6:30 am summit of the highest point of our Annapurna trek, Thorong-La Pass at 17,769 feet. “Coffee. Tea” the flight attendant asked wearily. “I’ll take a coffee with sugar, please” I responded half-awake yet with a smile. We were two hours short of our 15-hour non-stop flight from Chicago to Delhi and I could hardly believe we were almost there. I had seen the sun set and rise and set again all within that time and needless to say, my body was confused. I had no idea how I’d manage to go to bed that night. It was 8 PM in India but my body was still on Minneapolis time, a bright and early 8 AM. It was going to be interesting. As we made our final descent through the thick, dark blanket of pollution that covered Delhi I couldn’t help but think about why I was here and where I was headed: To Nepal to hike the mighty Himalayas with my beloved dad. How on earth did I come so far with such a grandiose plan for a vacation? Even I, a stay-at-home mom of two young children, couldn’t believe it was real. My father and I have been traveling partners all my life. What started out as numerous family vacations throughout my childhood lead to annual vacations with just my dad to destinations around the world. Over the past ten years, we hiked Machu Picchu in Peru, dived in Australia’s Great Barrier Reef, hiked in Patagonia twice, played golf in Ireland, went skiing in Italy and France, and went on a safari in South Africa. My friends thought I was crazy. But I felt invigorated and alive. Nepal was one of those elusive, mystical places in the back of our minds that we had dreamed of visiting one day. It had everything we wanted in a travel destination: Majestic scenery, world-class hiking, unbelievable mountains, and a diverse and fascinating culture. Yet it was impossibly far away and would require a fair amount of time to see. We also had no idea how safe or doable it was to hike. When thinking about Nepal, my mind easily crept to those crazy, over the top athletes who climb Mount Everest. I thought there was probably more tame hiking adventures but didn’t truly know. Thus as an actual travel destination, Nepal remained a very distant possibility. Perhaps someday we would go there. Little did I know it would be sooner than I ever imagined. My dad and I had just returned from a spectacular hiking trip in Patagonia, Argentina where we had first caught wind of the real possibility of trekking the Himalayas in Nepal. During our trip to Patagonia, we had met an exciting couple from England who were in their sixties and had just completed the world-famous Annapurna trek the year before. My father and I listened in awe and fascination as they explained their trip and we were instantly hooked. It sounded like the trip of a lifetime that we could easily accomplish physically. Yet we just had to figure out how we could manage such a long trip. My children were only three and five years old and we would need at least two to three weeks. I wasn’t sure my mother or husband would be willing to babysit the children for that long. Thus once again, the thought of going to Nepal was placed on the back burner. Almost like a sign of fate, my dad happened to see an article in the New York Times on March 10, 2010 called “Hiking the Annapurna Trek Before the Road Takes Over”. Basically what the article said was that this world-renowned hike was going to be ruined within a matter of years by the building of a dirty, dusty road that would tear through idyllic villages and pristine nature and open this once hidden, mystical land to jeep, car, and bus traffic. That was all we needed to hear and it was soon decided that the time to go was now. We gingerly presented our idea to both my husband and mom who surprisingly were in full support of our plan and gave us the green light to start planning. We were thrilled. Me and my dad at the start of the trail. The start of the Annapurna trail is gravel now. Yet not for much longer as a road is in the process of being built from the start of the trail all the way to Manang which currently takes eight days to reach by foot. The New York Times article recommended two trekking companies. We sent query letters and received a reply almost immediately from Earthbound Expeditions, a locally owned and run outfitter in Nepal. We received a custom itinerary that perfectly met our needs and time constraints, and had amazingly prompt replies to all my crazy questions such as the safety records of internal flights in the mountains to the availability of calling home while on the trail. I was amazed and impressed by the high level of personal attention and service given by Earthbound’s owner, Rajan. This kind of service has long disappeared from most American travel companies. We booked the trip for the end of October 2010 for a 17-day journey that inspired and excited me beyond my expectations. Before leaving for Nepal, I made a decision that I no longer wanted to be simply a tourist that visited a country, enriched myself in all its culture and beauty, and left nothing in return, no gift behind. My new way of thinking all began on a recent trip I made which was different from anything else I’d ever done: A volunteer trip to work in Costa Rica. Although I was only there for one week, the impact volunteering made on my life and the people I helped during that short time led me to believe strongly that we must give back. Travel is a gift and it is important to give in return. I wracked my brain for different ways I could raise money. I knew that I wanted to donate money to a non-profit organization that focuses on education in Nepal. After reading several inspirational books on education in poverty-stricken lands, I knew that this was the area to attack. I searched Lonely Planet who has an excellent listing of non-profit organizations as well as volunteer opportunities, and found just the organization I was looking for: READ Nepal. “READ Global pioneered the concept of sustainability as an international development organization dedicated to combining education and private enterprise to make rural communities viable places to learn, build, and prosper. READ partners with rural communities to create, sustain and grow projects in a manner that is politically and culturally appropriate. READ has helped establish forty nine Community Library and Resource Centers paired with for-profit enterprises throughout Nepal and India that serve over a half million people annually and has also recently opened up a center in Bhutan”. Nepalese children dressed proudly in their school uniforms waved as we passed them by. Finding the right organization was the easy part. The hard part was figuring out how a stay-at-home mom could raise the money. I didn’t want to ask for donations from friends and families. Instead, I wanted to earn the money and somehow involve my children in the process so they could learn the importance of giving back. That was where creative thinking came into play. It was summer in Minnesota, a time to be outdoors, out of our long winter’s hibernation, and back into the world again enjoying our 10,000+ lakes, beautiful parks and nature. Initially, I set a small goal of raising a couple hundred dollars for my cause. But as time went by, I realized it was possible to do more. I just had to be creative! I set my first goal at $500 and used traditional American-style activities to raise the money. In June, I ran a co-op “babysitting fundraiser” at my house on Friday mornings. Each Friday I babysat up to ten kids in exchange for a small donation. Although it was incredibly exhausting, it was a terrific success. In July, my children and I ran a car wash and lemonade stand to raise money for Read Nepal. Once again, I was pleasantly surprised by the generosity of my friends and neighbors who contributed donations. Finally, in early September my family and I held our first annual yard sale in the name of charity. Through these efforts, my initial goal of $500 suddenly amassed to $2,000 and I was ecstatic! The $2,000 raised was matched by my husband’s employer, bringing the total donation to READ Nepal up to $4,000. Just like that a small idea ended up being a big help. The funds were donated a week before I boarded the plane to Kathmandu. READ Nepal was delighted with the donation and informed me that the money would be more than enough to open up an entire library and reading center in rural Nepal. They were beyond thrilled and continually showered me with compliments and called me “their little Angel”. I was so shocked to receive such immense gratitude for what I thought was a small amount in the grand scheme of things. Yet it made me realize how much ANYTHING can do to help, especially in this economic climate. It just goes to show how far your money can go in a third world country. The gift was given and I realized that it is the things you do for others in life that makes you feel the best. Photo of three Nepali girls dressed in their finest clothing in honor of the Festival of Lights, one of the biggest holidays in Nepal. The girls went from table to table, singing and dancing and then asking for a small donation to help pay for school. As a world-traveler I was completely unprepared for what I would see in India. Complete and utter chaos, poverty and pollution beyond anything I’d ever seen before in any of my travels. My heart sank. The cultural shock of India hit me like a punch. I was blown away and honestly, a bit afraid. View of one of many slums in Delhi. We arrived at our hotel, thankfully without hitting someone or something in the chaotic lines that made up the roads and I took a deep breath and sigh of relief. I had heard that India was a little chaotic yet what I had just seen stirred up some serious culture shock in my normally open mind. That was when I met the owner of the hotel and he told me the most important thing I’d ever learned about traveling and culture shock: The importance of having and maintaining the third eye. In the Hindu and Buddhist religions, the third eye is a symbol of enlightenment and wisdom and is commonly seen in Indian and East Asian countries represented by a dot, eye or mark on the forehead of deities or “enlightened beings”. I received my third eye in a timely manner. Right after we entered the hotel, we were welcomed with a traditional marigold necklace and the third eye dotted on our foreheads to remind us that we needed to see India with an open mind. This idea stuck with me throughout the trip and was probably the best advice I could have ever received. It was so powerful that I decided that it would become the name for my new blog as it incorporated all my ideas about how I wanted to see the world and how I wanted to communicate my travel experiences with others. For travel is definitely an enormous learning adventure and when visiting other cultures, especially ones that are so incredibly different than your own, you must keep a third eye. Otherwise you would miss out on seeing what travel is really about: seeing and learning how other people around the world live, thinking about what you’ve learned, formatting opinions on it, and most importantly, sharing this knowledge with others. If you don’t have a third eye, what could you possibly learn? Me after I received my marigold necklace and the third eye. Nepal was utterly amazing. The trek was arduous, humbling and long. We hiked over 100 miles doing on average 4-8 hours of strenuous hiking a day at altitudes up to almost 18,000 feet. But what amazed me most was the magical culture and people that I found in Nepal. It is one of the world’s poorest countries in which over 80% of the population is rural and the majority of people survive on less than $2 a day, not even a cup of coffee in the US. Yet, the rich culture and traditions of the people rose above the impoverished conditions that most villagers live in. Leaving Kathmandu and heading to the mountains. The beautiful rice terraces and lush green Kathmandu Valley. 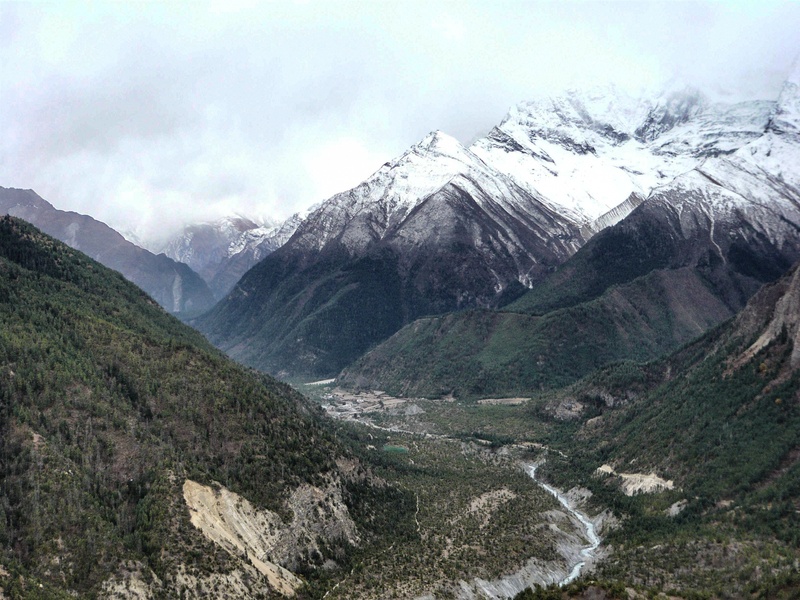 My first sight of a fresh coat of snow over the Annapurnas in Manang took my breath away. 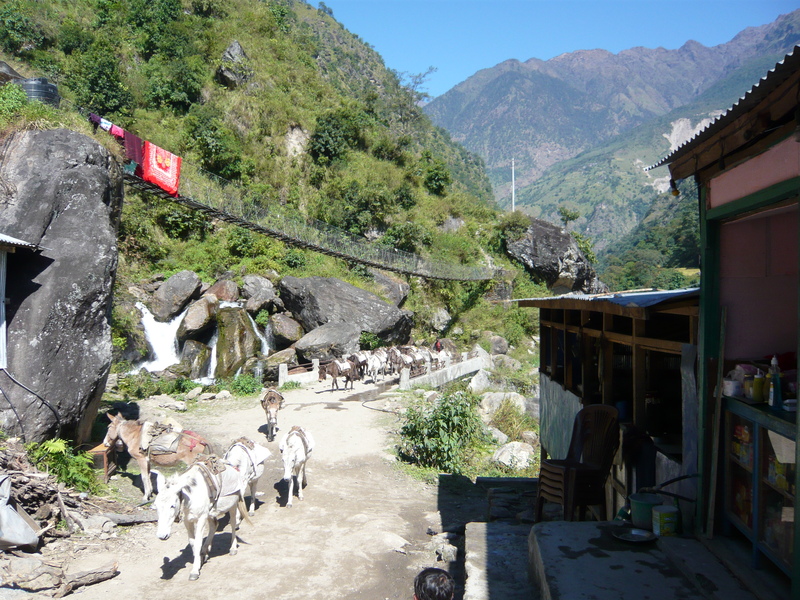 Along the Annapurna trail, you walk through many villages and are greeted by the rural Nepalese, goat herders, chicken sellers, mule trains, and yaks. The Buddhist influence greets you at each village as you pass by Buddhist prayer flags, temples, prayer wheels and the smell of burning juniper. Being blessed by a 94-year-old monk who lives in a cave monastery at 13,000 feet near Manang. After completing the trek, I realized why it is called one of the best treks in the world because no other trail has such magnificent scenery and fascinating culture. No other trek I’ve done has ever gone directly through villages and has allowed me to walk side by side villages doing their daily business. We passed goat herders, mule trains, men carrying 20 chickens on their backs in a wire cage doing his sales rounds, happy children dressed in their worn school uniforms, Buddhist temples, shrines and prayer wheels and prayer flags. It felt like being on another planet. And that is what brings me back to why Nepal changed my life. As our jet plane took off for home and climbed five thousand, ten thousand and then eighteen thousand feet, I realized in awe that only a few days ago I had been at almost the same altitude as the plane. It was a wild thought; almost a little frightening. Our porter Chhring, me, our guide Hari and my dad in Manang, where the road will end. We shared many wonderful days together talking, laughing and sharing our cultures. As I looked down, I was finally was able to conceptualize how high 18,000 feet truly is. The buildings became smaller and smaller, the cars like ants lining the roads. The vastness of the green, voluptuous rice fields stacked one on top of the other, bursting in color and life. Then, for the last time, I saw the godlike, mighty Himalayas, strikingly beautiful, like a mirage of flying towers soaring upwards into the heavens of the sky. I found it hard to believe that I was really here and had really been there. It was all like a dream. Nepal was one of those eye-opening moments in my life in which I realized not only how blessed we are to live in a free, prosperous country (where we have the pleasure of the “western toilet, clean streets without piles of garbage, education, opportunity and space), but how important it is for us as privileged people to give back. Visiting Nepal struck a chord in my heart and made me realize how impoverished these wonderfully, peaceful and loving villagers are. Over 80% of Nepalese live in rural areas that have little or no access to education. I believe strongly that education is the key to a better future and a better life. From that trip on, I was determined to change my life and figure out a way to keep giving back. This young Nepali girl made me smile. Almost as if an act of fate, I somehow or another found a way to follow my dreams and continue my work fundraising for education in Nepal. As we were leaving Kathmandu, Rajan, the owner of Earthbound Expeditions, our trekking company, gave me his card and mentioned some of the social work he is involved with in Nepal. On the back of the card was the small, grass-roots NGO called HANDS in Nepal. As soon as I got home, I contacted them. It was the perfect fit and my charity work continued. Over the last six months, I have raised money to help HANDS in Nepal a small grass-roots organization created by a young American Danny Chaffin. HANDS in Nepal’s mission is to create educational opportunities and community development programs in rural Nepal by building schools, donating educational supplies, teacher’s salaries, and student scholarships. I have done most of my fundraising work through the sale of beautiful, homemade Nepali goods such as pashmina scarves, yak-hair blankets, and purses and bags. Since May, I’ve sold over $4,000 of my Nepali wares and over half of that profit goes back to HANDS in Nepal (after taking in account the cost of the products, shipping and customs). It has been a win-win opportunity as the sale of the products not only benefit HANDS in Nepal but also the rural, poor Nepalese people who are making and supplies these little treasures for me to sell. I have also used my second annual yard sale as a way to raise money for HANDS in Nepal. After scraping together all my old clothing and miscellaneous items that we no longer need, I was able to raise $540 for HANDS in Nepal. A composition notebook and pencil for 540 children. Two school workbooks and a composition notebook for 108 children. A school uniform and backpack for 54 children. Chalkboard and teacher supplies for 10 classrooms. A book set for 27 classrooms. Almost enough for one teacher’s salary for an entire year. A combination of some of the above items. In a country where 82% live in rural communities and have little or no access to education, and the average daily salary is less than $2 a day, this small amount of money goes a long way in fighting poverty and helping educate Nepal’s future generation. With a literacy rate of barely over 50%, there is a long way to go. However, it is my belief that every effort, no matter how small, can help make the world a better place. There is something so special and magical about giving back that just makes me feel complete and my hope is that I can eventually reach the $8,000 mark to build a new school in rural Nepal and have a lasting impact on an entire village and generation of people. It will take time of course to raise the money but with the help of my friends, family and children as well I plan to achieve it! Photo above of Jan and her son Danny along with the children of the new school made possible by HANDS in Nepal. As many of you know, I’ve been actively fundraising for a small, grass-roots NGO called Hands in Nepal which focuses on building schools in rural Nepal. Most of my fundraising efforts have been done through the sales of beautiful Nepalese, Tibetan and Indian treasures such as hand-woven pashminas, scarves, yak-hair blankets, bags, purses and even baby clothes. Since late spring, I’ve been able to fundraise $1,670 to date and now have over four boxes of lovely merchandise to sell at upcoming events. My goal is to raise the $6,000-$8,000 required to build a school in rural Nepal, a place in which 82% of the population live in remote villages and many have little or no access to education. Only about half of the population of Nepal is literate and most people live on less than $2 a day—-less than a cup of coffee! I became involved with this organization after trekking the mighty Himalayas last November mostly because I fell in love with this country and its people and more importantly, I wanted to help and make a difference in people’s lives. The founder of Hands in Nepal, Danny, is an impressive young man, still in college and in his early twenties who works together with his fabulous mother Jan, an educator, as well as several local Nepalese contacts. This summer Danny, his girlfriend Bree and his mother journeyed to Nepal to build their second school in the remote village of Phulkarka to help with the completion of their second school. Here is a video Danny recently posted to YouTube which highlights the remoteness, beauty and poverty of this unknown village in Nepal. Danny’s mother Jan, is working on setting up a sewing co-op with village women to help them learn to make a living and improve their lives. Together, Danny and Jan make a wonderful team and go to show you “if there is a will, there is a way” to making a difference in people’s lives. Each school will educated over 80 children that had little or no access to education at all. An amazing story and testament to the will and power of people to make a difference! To read more about Hands in Nepal, Danny’s work, and my personal travels to Nepal, please visit my earlier posts under the topic “Nepal”. Rural village in the Annapurna range taken from my recent trip to Nepal in October-November 2010. (For more photos and stories on my trip to Nepal, please refer to older posts located under “Nepal”). As some of you are aware, I’ve been actively fundraising over the last two months to try to raise money to help a fabulous grass-roots NGO called HANDS IN NEPAL (www.handsinnepal.org) build a new school in rural Nepal. A recent trip to the Annapurnas back in late October/early November struck a cord in my heart and made me realize how impoverished these wonderfully, peaceful and loving villagers are. Over 80% of Nepalis live in rural areas that have little or no access to education. I believe strongly that education is the key to a better future and a better life. Thus, I have worked hard over the last year or so finding NGOs that work in education and help to improve the accessibility of education and learning to the masses, especially in poor, third-world countries. I’m pleased to say that over the last two months I’ve been able to raise over $1,000 for HANDS IN NEPAL mainly through the sales of hand-made pashmina scarves, yak-hair blankets (made in Tibet) and other local Nepali products. To me, it feels like a win-win situation as I’m able to offer beautiful products to my friends and family that are made directly in Nepal (and Tibet for the blankets) and donate all the funds directly to Hands in Nepal. After two weeks hiking from village to village through the Annapurnas, I saw firsthand how hard these women work to sell their beautiful, handicrafted products. They would be sitting there all day long, some of them not much older than twenty selling their handwoven scarfes, blankets, hats and gloves all for the mere price of two US dollars a piece! For us, it is less than a cup of Starbucks coffee but for them, it is a day’s living (as the average salary in rural Nepal is less than $2/day). As someone who has been so incredibly fortunate to have traveled to these amazing places, I feel like it is a requirement to give back to the community. Hence, I contacted Hands in Nepal and have worked with them ever since on trying to raise the necessary funds to help build new schools. Thus, it is amazing to me what a long way our money can go in such a poor country! Last night I held my fourth fundraising event, a wine and cheese party at my home where I told the story of HANDS IN NEPAL and offered a select collection of Nepali products for sale, all in the name of charity. It was such a wonderful feeling of accomplishment to hit over the $1,000 mark! It felt so good….like nothing I’d ever experienced in corporate America (I was in sales for many years). Some exciting news is that Hands in Nepal’s founder Danny Chaffin’s mother Jan is headed to Nepal this weekend to see if she can start up small sewing co’ops for the women. Many rural Nepali women are forced into prostitution as there is no other way out. Human trafficing is a huge deal in Nepal and Jan is hoping to start up another NGO to help these women and give them more options and hopefully a better life!